Earlier this spring, my husband was a stressed out mess. Between Tom’s MBA classes, job hunting, and a demanding full-time job, he decided two weeks before his school’s spring break that he needed to get away from it all and lay on a beach with a drink in his hand, doing nothing but relaxing for a few days. Tom had a whole lot of this in mind. I happily persuaded this course of thinking, also excited about the prospect of warm seas and Pina Coladas. While we talked about where to go, the all-inclusive Zoetry resorts kept coming up. “It’s exactly what I need,” Tom said. After doing some budget finagling and checking our airline miles, we decided we should be able to swing it. So back to Zoetry we went. This is the view that greets you when you arrive at Zoetry Paraiso de la Bonita. 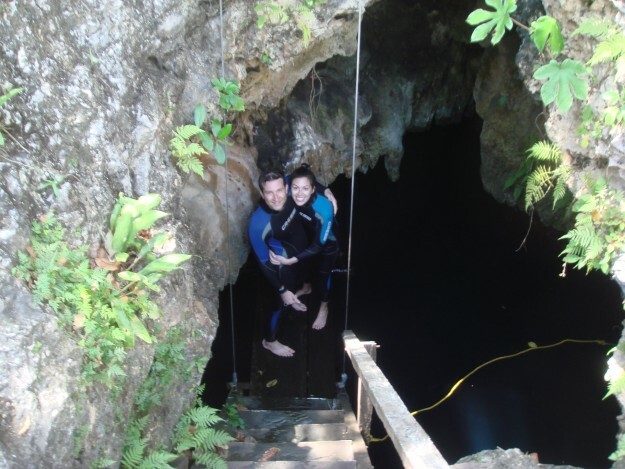 Our first time to Zoetry was last summer for our honeymoon and we went to Zoetry Agua Punta Cana in the Dominican Republic. It was pure bliss. I’d never been so relaxed on a vacation. Did we leave the resort? No. Did we want to? After the stress and busyness of the months leading up to our wedding, no, we had no desire to. We were completely fine with having our every whim catered to while we laid by the beach or lounged by the pool, with breaks to eat surprisingly delicious cuisine. 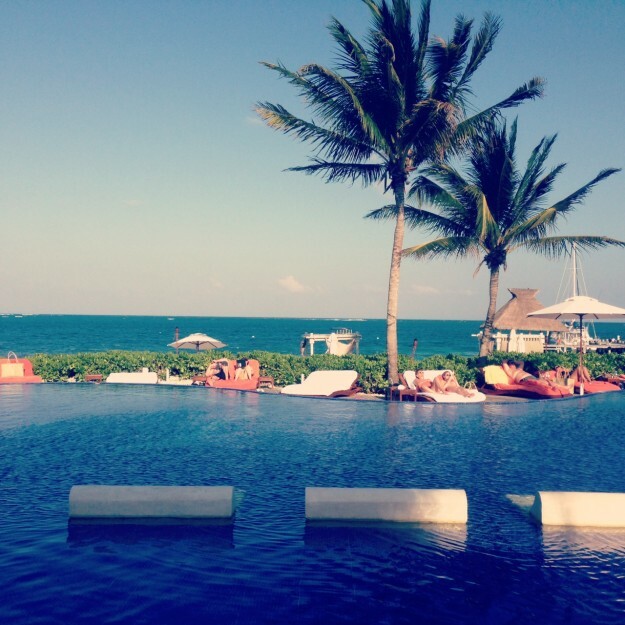 We hoped trying a new Zoetry resort, the Zoetry Paraiso de la Bonita on the Riviera Maya, wouldn’t disappoint. 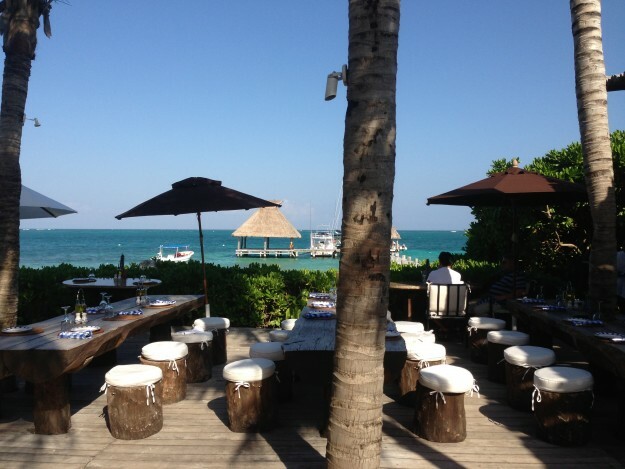 What if the magic we’d experienced with the brand was only at Zoetry Agua? Our fears were quickly soothed. As soon as we arrived at the Cancun airport, we were whisked away in an air-conditioned van and provided with cool towels and champagne as we drove the twenty minutes south to the resort. On its website, Zoetry Paraiso de la Bonita looks like it’s in the middle of a tropical jungle. Having been to the Riviera Maya, Tom and I couldn’t see how that could really be the case since the Riviera Maya is jam packed full of resorts. The images on the website did not deceive. Zoetry Paraiso de la Bonita is located down a long private dirt road leading through land that hasn’t been bulldozed over for resorts. The road branches out to a few other upscale resorts, but Zoetry Paraiso de la Bonita doesn’t appear until the end of the road is reached, and there isn’t even another resort close by it, just oceanfront townhomes that people own. We stepped onto the grounds of the resort and relaxation began. Oceanfront suites and pristine sand awaited us at Zoetry Paraiso de la Bonita. The Zoetry resort brand tries to incorporate in the surrounding land and culture into the rooms and Zoetry Paraiso de la Bonita gave their rooms a Mayan touch. Off-white walls with jungle accents awaited us in the separate living room and bedroom. The living room opened up onto a large balcony with its own sunbed (which I loved and spent most of my time in our suite on) and the bedroom led into a pretty amazing bathroom. The bedroom had a comfortable bed and jungle touches. The massive bathroom. I loved the sinks! Not only was the bathroom huge, it had two very cool amenities. First, the tub had a very luxe rustic vibe to it, built into the stone and with the water spout coming out of a lion head. Secondly, you got to go to the bathroom next to a lovely little green garden. I’m not exactly sure what the point of the garden was – maybe it created more oxygen in the room? – but I was a big fan of it nonetheless. The accommodations at the resort are all oceanfront and gently curve along the beach around a grassy area. During the day, large lizards make it their home and you can see them prowling around or sunbathing in the grass from your balcony or patio. The beach of Zoetry Paraiso de la Bonita is a private one and no hints of neighboring resorts and houses could be felt. It was clean and wide with numerous cabanas and no shortage of beach chairs. Servers came around to bring drinks and food so we never had to leave the wave’s side if we didn’t want to. Enjoying the waves on a beach chair built for two. Zoetry Paraiso de la Bonita has a large main pool, which is a focal point of the resort as soon as you walk through the front entrance. The pool borders the sand though is divided by planted bushes. Sunchairs and loveseats surround the pool and the smell of the ocean drifts through the air as friendly servers bring around tropical drinks and bowls of guacamole and chips. The resort is home to several parrots as well who often hang out by the pool on a sunny day. I’m a beach lover, but the pool was so nice and relaxing, it was hard to leave. Zoetry Paraiso de la Bonita resort also has a second pool in the spa, which is open to adult guests: the Thalasso Pool. This pool is filled with salt water and has many jets for a soothing back massage. The pool has a peaceful location next to a wide grassy area and small lizards can often be seen close by the pool basking in the sun. The Thalasso therapy pool at Zoetry Paraiso de la Bonita, which was adjacent to the spa. One of the benefits of staying at a Zoetry resort is the open access to the onsite spa amenities. Though treatments such as massages, wraps, and facials are extra, all guests can access the spa’s pools and relaxation rooms whether you have a spa treatment appointment or not. Paraiso de la Bonita has a world-renowned Thalasso Center, which focuses on wellness treatments through the healing properties of seawater. Part of the Thalasso Center includes a heated tub area that is adjacent to a cold plunge pool. Lounging in the heat of the hot tub, followed by a plunge in the freezing cold water was a surprisingly great way to revive myself before dinner after lying in the sun all day. The Thalasso pool and spa area ended up becoming a favorite part of my vacation. One of my favorite parts of the Zoetry brand is their amazing food. They don’t skimp at all on ingredients and presentation. You’ll find no buffet here, just carefully put together menu items and pleasing service. El Chiringuito was my favorite onsite restaurant. It was outdoors right by the beach and they grilled freshly caught fish – you could even get the whole fish, which I had to do (despite my not so great attempts at eating whole fish before). Dining al fresco at El Chiringuito. This fish entree at El Chiringuito was a bit scary looking, but AMAZING tasting. The La Canoa restaurant is a AAA Four Diamond restaurant with an elegant ambiance and has a French-inspired menu. While the meal was flavorful with inventive menu options, I thought the food was just as great at their other restaurant, Kaax, which has a more laidback, tropical feel, and I actually preferred it as a dining venue for both food and ambiance over La Canoa. Kaax also had the biggest menus I’d ever seen. Zoetry Paraiso de la Bonita offers an array of classes and activities ranging from bracelet making and massage techniques to tequila tasting and catamaran cruises. Many of the most popular activities fill up fast, so if there’s something you for sure want to partake in while staying at the resort, sign up for it right away. The daily schedule that’s left on your bed each night lists out weekly activities as well. Luckily, Tom and I didn’t miss out on getting onto one of the nightly Sunset Catamaran Cruises, which ended up being a highlight of the trip. The sunset cruise is included in the cost of your suite and it takes guests out onto the harbor right before sunset. You’re offered Champagne and taken around the sea for an hour while watching the sun set. Relaxing onboard Zoetry’s catamaran with a glass of champagne. Zoetry Paraiso de la Bonita also has scuba diving, snorkeling, fishing trips, and other water activities you can partake in for an extra fee. These activities are convenient since most of them leave straight from the resort’s private harbor located on the south end of the resort. Zoetry Pararaiso de la Bonita was just as wonderful as Zoetry Agua Punta Cana and had its own distinct charm. When Tom and I tried to compare the two, it was hard. We liked the tropical accommodations of Zoetry Agua better, but preferred the Thalasso therapy pool and hot tub at Zoetry Paraiso de la Bontia over the spa pool in Punta Cana. We couldn’t find fault in either one, however.